We here at Advancing the Interests of Animals oppose the rodeos in all forms, including charreadas, or Mexican style rodeos. There is no doubt that animals are abused in the rodeo. Consider calf roping, in which frightened three to four month-old animals are chased by a rider and then lassoed around the neck. Frequently the rope becomes taut so quickly that the calf’s neck is severely injured. In the videos below you will see examples of the calves literally spinning in the air when the rope is pulled tight. Then, the animals are picked up and slammed down into the ground by the contestant who then ties three legs together. It is notable that the Professional Rodeo Cowboys Association no longer uses the term calf roping to describe this violent event that exploits and frequently injures the animals. Rather, “Tie down roping” is used, a term less likely to remind people that baby animals are being abused. This event bears little resemblance to the traditional techniques and skills used by real cowboys in the past. It is simply abuse of juvenile animals for entertainment and profit, all in the name of sport. It is nothing less than barbarism. Further, what lessons are we teaching our children who attend and participate in rodeo events? They learn that we people are in charge of animals and that they are here for us to use as we wish. It is not what we want our children to learn. 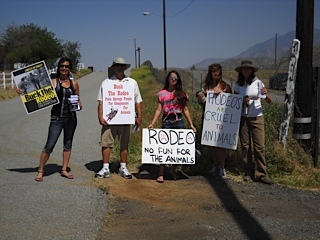 A spunky group of animal lovers gathered to protest the 2012 Palm Springs Hot Rodeo, which was held in Banning, CA. Organized by Advancing the Interest of Animals, the demonstrators stood with signs at the parking lot entrance, where they could interact with the patrons. 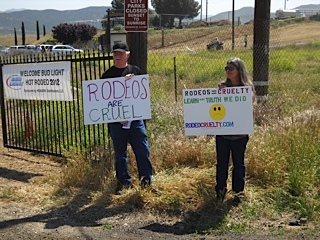 The animal lovers asked the attendees to face the reality that rodeos are animal cruelty, and handed out informational fliers. Many attendees left the event telling us that we were right and that they agreed with us! Also, attendance was rather weak, so maybe this will be the last year this rodeo comes to town.